The full colour hardback book serves the needs and interests of the most discerning people in the world. 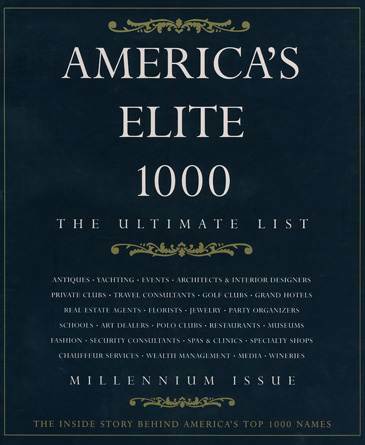 America’s elite 1000 is based on the editorial concept of the hugely acclaimed Europe’s Elite 1000. Whether it is the right art dealer, the best interior decorator, renowned surgeon, private charters, event management or travel consultant, readers can depend upon America’s elite 1000 when seeking the highest quality and most professional advice. Elite yachts to charter are what Ultra Marine and Cindy Brown specialise in. Cindy Brown, Ultra Marine founder and CEO, provides high-end private charters for her clients and knows what they want. Brown’s focus is on hospitality. No request is too difficult: Egyptian cotton linens, organic fruit, restaurant reservations are all par for the course. Ultra Marine specialises in elite mega yachts, but Brown can also get you a charter on the elegant refurbished 130-foot J-Class America’s Cup sloop ENDEAVOR.